Real time / Real Business: high hospitality incorporates high tech! In the comfort of the innovative Videoconference Room, THotel provides you with the Polycom HDXvideoconference system, a functional modern set-up giving that added plus to your business meetings, even in the presence of complex and far from economic distances, time schedules and weather conditions! But more besides: thanks to our Videoconference Room you can reduce the need to travel for both yourself and your colleagues and co-workers, saving both time and money whilst displaying careful attention towards the environment. The sophisticated Polycom HDX room technology will permit you to take realtime decisions with distant colleagues and coworkers, and to share all types of electronic documents (Powerpoint presentations, videos, audio files, etc.). Each videoconference session will connect you interactively with up to 4 people from 4 different locations. 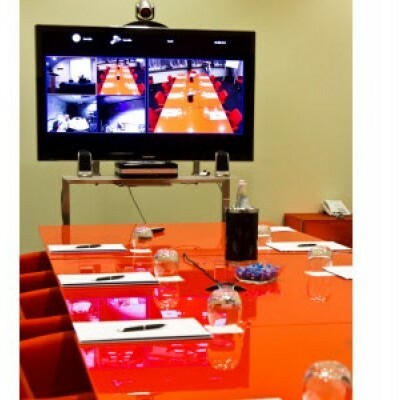 The possibilities afforded by the Videoconference system adopted by T Hotel are universally acknowledged by Global Virtual Interviews, a leading company in the field relying on the use of approximately 3000 videoconference rooms throughout the world, and providing a high standard service in the organisation of remote conferences and business meetings. "We were totally satisfied with the service we received from your hotel (…). Our client was also satisfied with the connection (which can be the most important issue for my clients).” Alastair Angus, Director at Global Virtual Interviews Limited. For info please contact congress@thotel.it or call +39 070 47400.